Moldovan culture includes traditions, arts and public education. It is formed as a result of a long collaboration with the cultures of other countries neighbouring Moldova: Romania, Ukraine and Russia. The development of Moldovan culture is beyond all doubt attributable to its history - the influence of the Roman colonisation, contacts with East Slavic population and many others interactions over time. Ceramic products exhibited at the Museum are several hundred years. Every autumn, in September, the museum is held a..
Pension “Casa Părintească” (parents' house) is located in the village of Palanca, Calarasi region of Moldova and is a.. 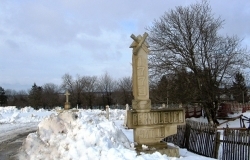 Historical monuments of the village Temeleuti. Unfortunately, the house and the farm buildings of Boyar Meleghi have.. In the village Valeni (Cahul district) is the most "delicious" Museum of Moldova. Monument to the Metropolitan - Petru Movile stands on the Stefan cel Mare Boulevard. This composition looks..
Museum of Romanian Literature "M. Сogalniceanu"
Manuscripts, documents, objects of art The museum exhibits more than 90 thousand items: manuscripts, secular and..